Dan Snow is to present a 3 part series for BBC Radio, examining the role of David Lloyd George, during the First World War. Lloyd George is Snow’s great, great grandfather and was the last Liberal to be Prime Minister. The documentary will chart how he went from being “anti war” to ultimately persuade millions of men to sign up to fight, while also encouraging millions of women to work in the munitions factories. 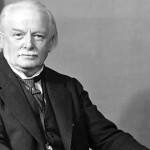 “People think of Winston Churchill and the Second World War but rarely talk about Lloyd George and the First World War. Yet arguably he had a more difficult war. We’d never fought a war like it,” explained producer Ashley Byrne. By 1918, Lloyd George was hailed a hero and called “the man who won the war”. The series also looks at his influence over a young Winston Churchill and how, in later years, he appeared to regret the conflict, which had killed so many. Snow will look through papers and letters to assess why he made the decisions he did. Made for BBC Radio Wales, Pobol Y Cwm actor Dyfan Rees will play Lloyd George; and veteran character actor Christopher Strauli is Winston Churchill. It starts tonight (December 3rd) at 6.30pm on BBC Radio Wales and will also be available on the iPlayer.